Daisy McFarland is at it again. As a cozy crime writer, she wants nothing more than to create the next Christie series that will skyrocket up the New York Times bestseller list. But her muse is stuck in neutral as she painfully tries to conjure up the perfect murder mystery. Stuck in a rut, the retired American schoolteacher, now residing in the quaint British village of Worlingburgh, decides to add some real-life exposure to stoke the embers of her waning creativity. Her quest leads her to respond to an advert for volunteer companionship at the regional residential home. Much to her surprise, the decision opens her up to a world of lively folk who enjoy a good natter and offer unexpected inspiration. What Daisy doesn’t anticipate is two deaths that occur in the sleepy village and the direct connection they have with those in the residential accommodations. When Detective Superintendent Sam Decker is called upon to assist with the case, Daisy has further opportunities to spend time with the attractive detective. Where do the two go from here, and will Daisy ever finish her cozy? Having attended a writer's conference in England, the setting was the perfect place for the mystery muse to strike. So both Summer of the Missing Muse and Winter Writerland came from the conference experience and people that attended became characters in the stories. My characters came from people I met at a writer's conference in England. However, I lived in Great Britain for a total of twenty-years so the culture and those that live there are very familiar to me. It was super exciting to write a cozy in a small village in England where I spent quite a bit of my time. Streaks of scarlet dripped like open wounds across the horizon. The sun’s final demise gave a slight reprieve to those trying to survive the day’s oppressive heat. Worlingburgh was no exception. Pavements shimmered under the blood-lit sky and the small town released a long sigh of relief as houselights flicked on and shades were drawn. Evenings offered freedom from the mugginess and Daisy McFarland joined the chorus of villagers who gladly waved goodnight to the sun-baking orb. Tapping on the keyboard produced nothing coherent or worthy of editing. 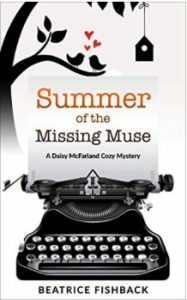 Daisy McFarland highlighted then deleted the hundred words she managed to squeak out for her new cozy mystery and stepped away from her desk in the kitchen corner. The computer’s blank stare made her blood boil. Where was that muse? Had she taken her bags and gone on a long holiday? Perhaps to a cooler climate? Or maybe she’d been bludgeoned to death. There were times Daisy wished the muse was real and she could coax, prod or bribe her into performing. Instead, there were many times the creative juices dried up and blew away like dust in the wind. She had no idea when they would show up again or would disappear with a puff. Beatrice Fishback, originally from upstate New York, lived in the East Anglian area of Great Britain for over twenty years and traveled extensively in the United Kingdom and throughout Europe. She is the author of Bethel Manor and Bethel Manor Reborn, Dying to Eat at the Pub, and Loving Your Military Man by FamilyLife Publishing. She has been published in various compilations, magazines and online websites. She and her husband have spoken to audiences worldwide and currently reside in North Carolina where scones are called biscuits and are topped with gravy, and tea that is served over ice.